I've been getting behind on so many things these days. We've been going through home repairs that ended up being a bigger can of worms than expected. It's put my normal every day routine out of whack! I was able to carve out some time between the jack hammer and tile removal to finish my Bonus Triangle quilt. The quilting was a fun adventure that was pedal to the medal...yet, not my usual straight lines. 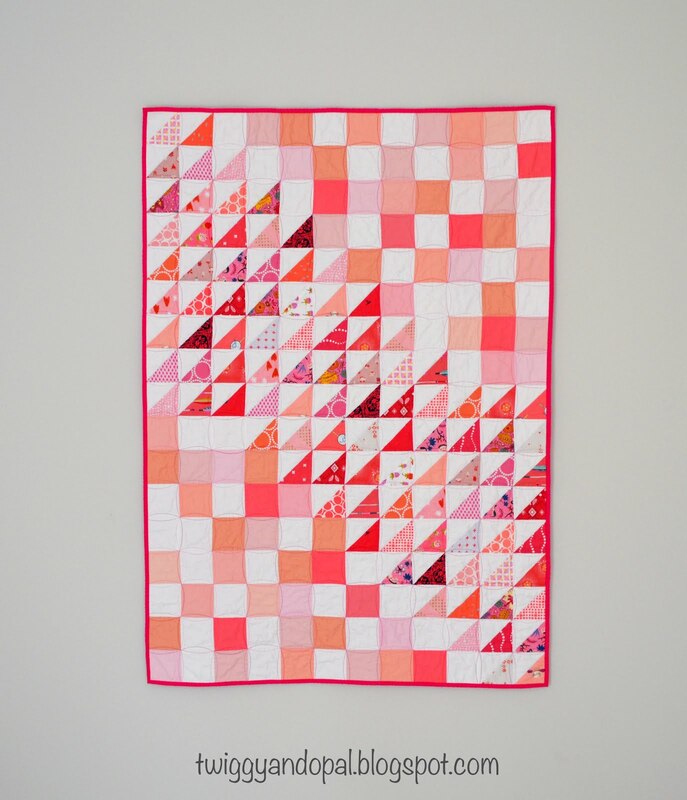 A quick refresher: This quilt was made with the bonus Half Square Triangles from a quilt I made using my 'X-Squared' quilt block. 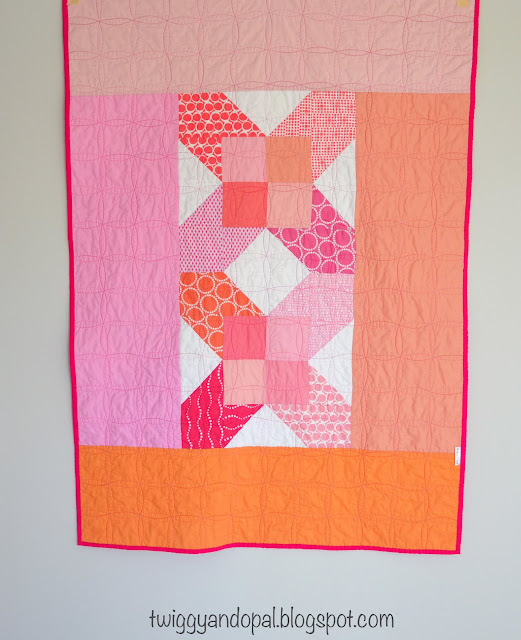 While it all started with this quilt: Pink With An Attitude, I have yet to start quilting on that one! For today we'll focus on an actual, real finish! So, the quilting you ask?! I will admit I'm a bit smitten with this quilting design. When strolling through Blogs, Pinterest or Instagram we always come across something that sparks our interest and we put it in the back of our mind for 'one day'. Sadly I cannot for the life of me remember where I saw the quilting that inspired me. I'd be happy to give credit where credit is due and I apologize for not remembering. I decided now was a good time to use some variegated thread. Not just any thread, Aurifil Pink Taffy (4660) 50 wt thread. Aurifil kindly provided me with this spool as part of the Aurifil Artisan program. The shades of pinks in this spool are so pretty! It's feeding my new obsession with all things pink these days. The blocks are 2 3/4" finished squares, and the options for quilting something like this are pretty endless. Yet, that inspiration quilting I had tucked in the back of my mind was all I could think about. It's like an orange peel and organic straight lines combined. I did not mark the curves or the distance from the seams, I relied on my eagle eye for semi consistent curves. Using my walking foot, I started at a corner seam and stitched a curve to the next corner seam. It's much simpler than it sounds. 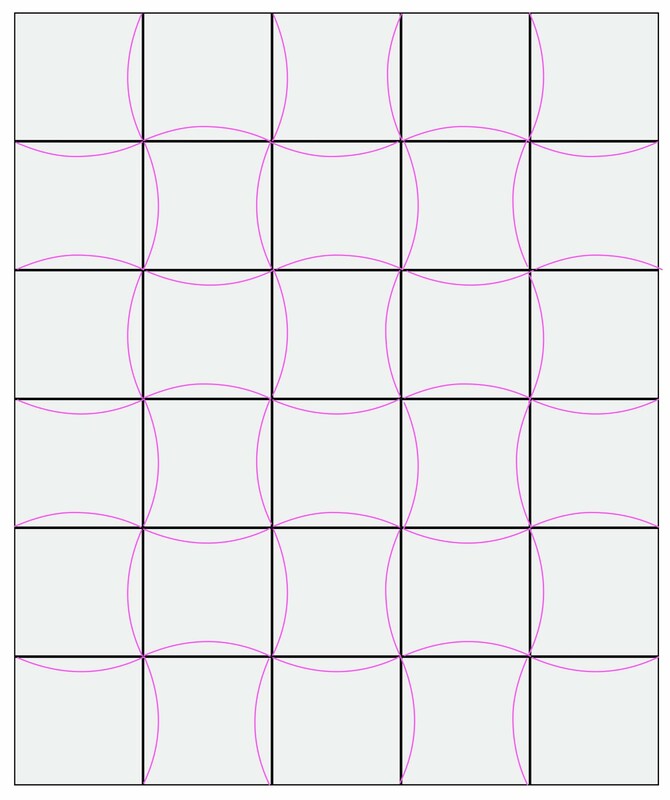 For those who need a visual aid, I made a quilting diagram. It is sometimes easier to show that tell! I quilted vertical lines and then the horizontal lines. From this diagram, it looks like apple cores! After the first rows, I repeated the process except quilting on the opposite side of the seams. After a little while you find a rhythm and the curves become easier. It really is a fun design and I know I'll use it often now! With the front being bonus HST's and scrappy, the back seemed like a good place to make a scraptastic backing! I had a couple 16" X-Squared blocks left over and decided to combined those with some solids. A double sided delight! I really wish I had more bonus HST's! There couldn't possible be a more versatile block on the planet...could there?! That being said...what's your all time favorite block? What do you think is the most all around multipurpose quilt block? Great result. Love making a new quilt from bonus blocks. Great range of pinks. 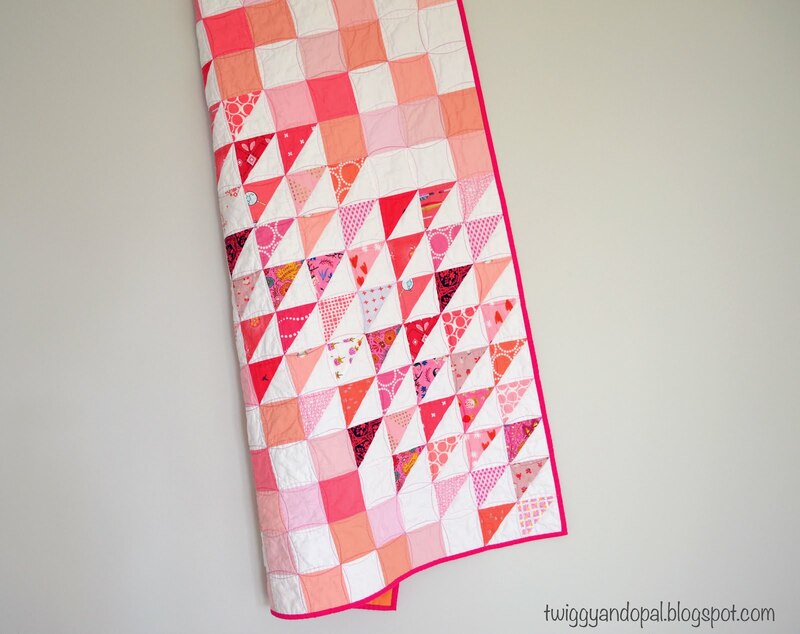 The quilting is great!! It pays to add an extra stitch line for the bonus blocks whether you use them right away or set them aside for later! I love how you used your bonus hst's. HST's are so versatile, my favourite by far. 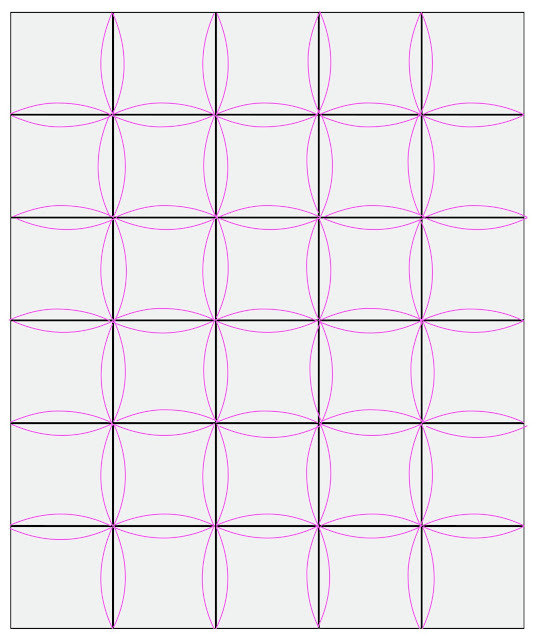 Thanks for the diagrams, they are a lot of help and I will try this quilting pattern next time. Wonderful idea! 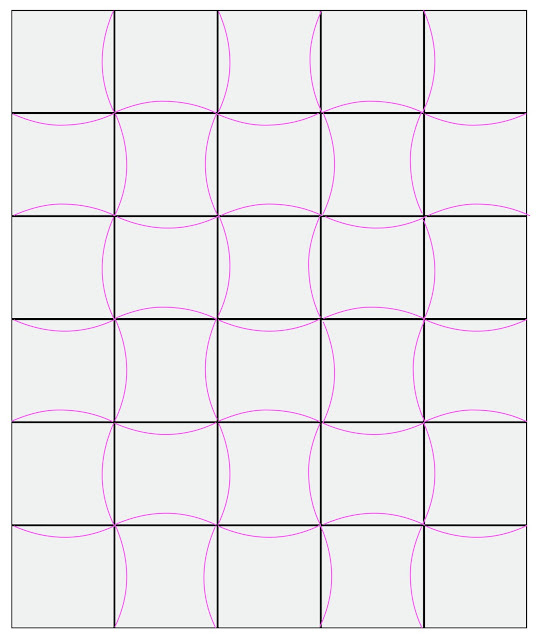 I knew I wouldn’t be able to explain the quilting well enough, so a visual diagram was in order. I’m glad it helped! Oh, what a perfect choice for the quilting, Jayne! Congratulations on the finish and I hope the home repairs are moving along steadily and you will be back to a quiet and normal home soon. Super sweet! I've done an 'organic' orange peel like that a couple of times, and I agree, it's fun to do! so cute! I think this design is one from Jacquie Gering's book, but I may be wrong because I didn't go back and check. 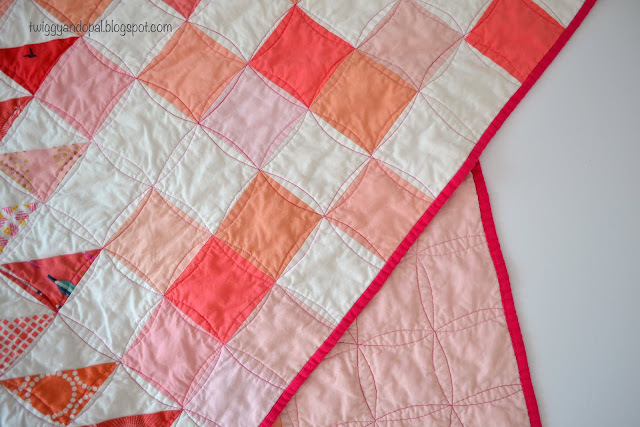 I've used that quilting pattern and I love it, too! It's very soothing to stitch, curving back and forth and back and forth. Love it in that pink combo thread! Fantastic use of the bonus HST's. I have so many little zip lok bags with these little guys in them. Combining them with coordinating solids is perfect and I intend to pin this for reference. 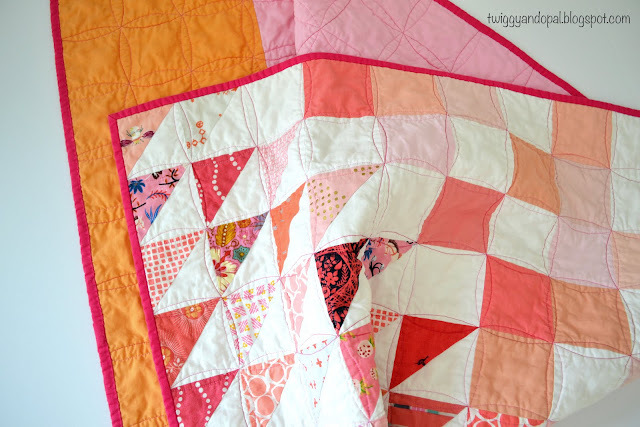 I love the orange peel quilting a -- it looks great and you did it with a walking foot. Perfect all the way around. I’m a big fan of HST’s and love how versatile they are. My problem is I can’t let them sit for very long before figuring out how to use them! 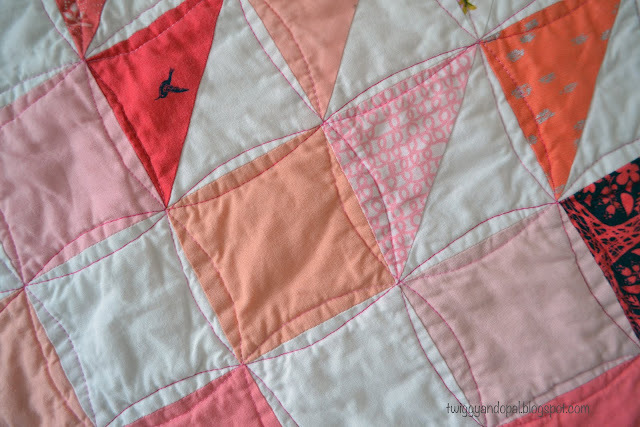 The quilting is all walking foot! I will use it many more times I’m sure!! Great use of your leftover bits. The quilt looks fantastic! I love the mix of triangles and squares. So simple, but yet so different. The back is awesome. It is a simple design, which is perfect for those bonus HST’s! The back was a win! Using orphan blocks and solids made my day! The mix of HST and squares was an inspired choice. Very pretty. The quilting worked out really well too. I might actually be able to do something like that. Congrats on a beautiful finish. Excellent use of bonus HSTs! Love it! 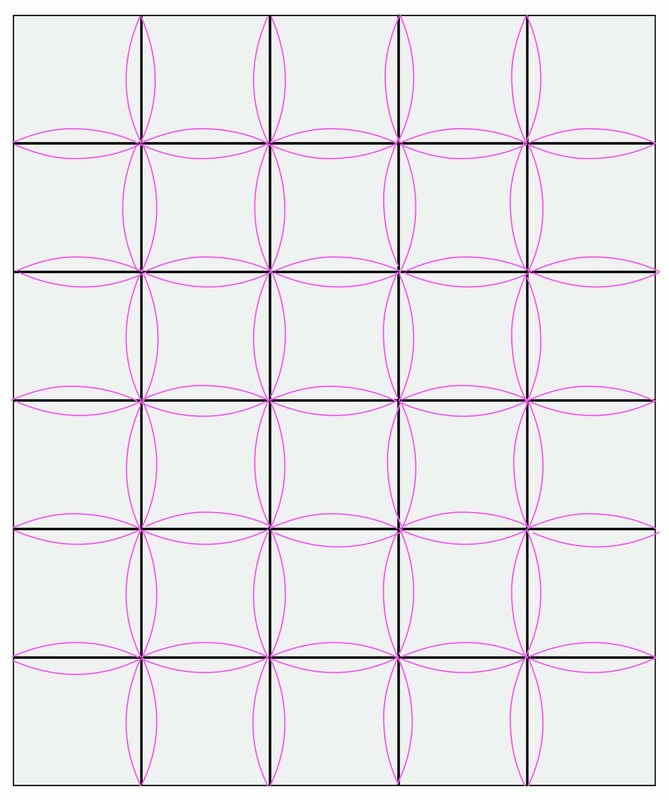 Thank you for sharing the quilting diagram. I've been looking at this design but thought it was stitched with circles. It fits this quilt too. Perfect use for your bonus HSTs ! 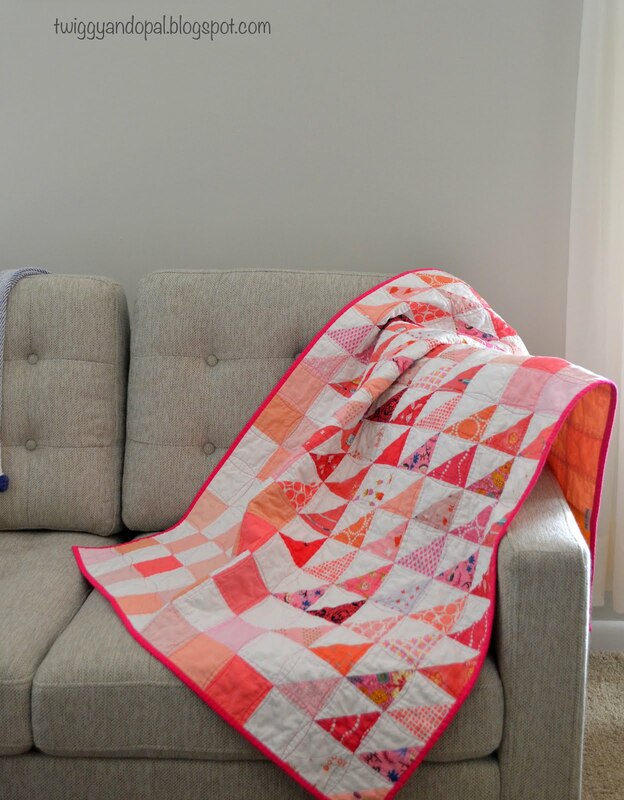 Your quilt looks bright and happy on the sofa. Such a great way to use up those leftovers, a very pretty finish! 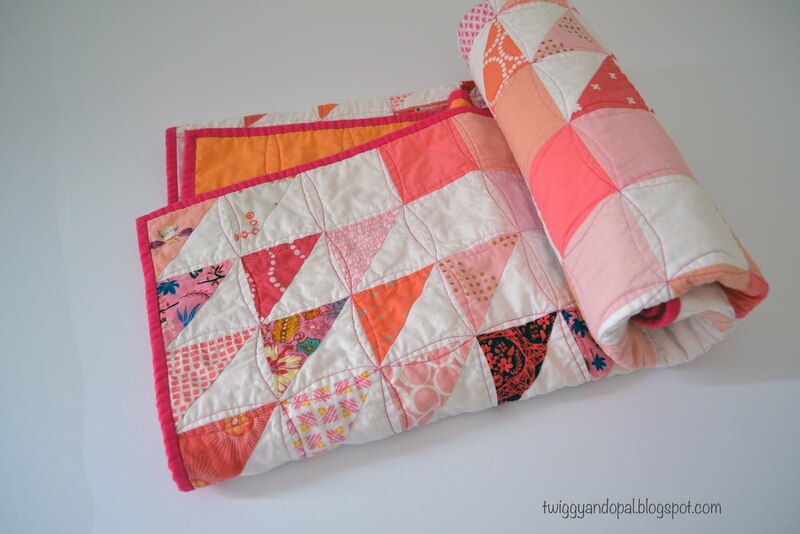 The quilting adds another pretty effect! The colors are gorgeous! I love the peach/coral/apricot/pink range and I think you've incorporated them beautifully in this quilt. Round Robin :: It's a Success!